Prom is expensive, so it might be smart to learn some tips for DIY prom makeup. Fortunately, there are some easy and simple tips that you can follow to make your makeup look professionally done at only a fraction of the price! Depending the condition of your skin, concealer can be applied either before or after applying foundation. When applying concealer, start with light layers and work up until the concealer blends perfectly with the foundation. Apply concealer only on problem areas, such as under the eyes or on uneven spots. Use your fingers (or a brush) to dab a light layer, and then use the pad of your middle finger, or brush, to tap the concealer until it blends. Don't rub your concealer in. Now it's time to apply any primer, foundation or concealer necessary to create the perfect canvas. For most high school students, a lot of foundation isn't necessarily required since teens still have that youthful "glow". However, you may have acne or an uneven skin tone that needs correcting. The key to wearing foundation is to make it look as if you don't have any on. It is essential to select a foundation that perfectly matches your skin tone, and to help keep shine at bay, a matching powder as well. Apply the foundation with your fingers by dotting small dots over your face using the fingertips. Don't use a sponge, since this can result in you wearing too much foundation, instead, consider using a foundation brush. After you have made small foundation dots on your face, blend from the mid-line of your face outwards, using your hand, or the brush. If using a foundation stick, apply and then smooth with a brush or your fingertips. You can finish off the foundation and concealer look by applying a very light layer of powder to ensure everything is blended. Make sure the powder matches and is fine and loose. Use a light, fluffy brush and tap the brush to dust off excess powder when you are done. Paying attention to the eyes yields great results! Since the prom is a special occasion, many people want a more colorful or dramatic look for the eyes. This can be achieved by selecting just the right combination of eyeshadow and liner and applying it to give your eyes a dramatic glow. Apply a base eye shadow to your upper eyelid. 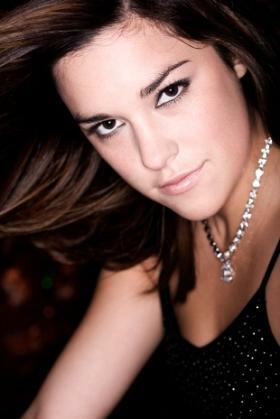 Choose a light cream based eye shadow, which will serve as a base and adhesive for your actual shadow. Choose a white cream base if you are lighter skinned, and choose a lighter beige if you have darker skin. Blend this into your eyelid until you can see your skin. To apply your lightest eyeshadow, choose a small, but angled brush, and apply the shadow to the entire lid. Note that if you are using a base or primer, you may not have to take this step. Repeat this until you spread the color up until your brow. Take a step back, look in the mirror, and make sure that your makeup is even on both sides. Next, use a different brush for the colored shadow. It should be a soft brush with a round head. The shadow you choose should match your liner. For example, if you have purple liner for your brown eyes, you could choose lavender shadow or a brighter pink. If you want the color to look distinctive, use a loose powder. If you prefer a blended look, then cream shadow is appropriate. Choose an eyeliner that suits your eye color. Green eyes might want try a plum color, and brown eyes might want to try a purple color. Those with blue eyes may favor violets, taupes, purples, grays or deep blues that can bring out the color of your eyes. Grey eyes also look good with shadows in shades of blue, but grey and black also work well for this eye color. Line your lower lash from the corner of the inside of your eye until slightly outside of the outer corner. You can use a highlighter pencil to emphasize the inner part of your eye. Trace the inside corner, bordering the tear duct of your eye. This will emphasize your face, and make your eyes pop. Next, take your eyelash curler and curl the lashes. 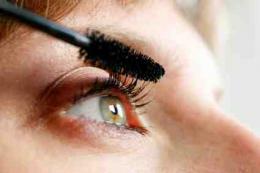 Curl lashes first, then apply a few coats of mascara. Apply mascara to your top lashes holding the brush horizontally as you apply going from the base to the tip of your lashes. For the bottom lashes, you can hold the brush vertically. No look is complete without lipstick, so any DIY prom makeup tips aren't complete without some advice on how to apply your lip makeup. To apply, use a lip brush, and begin the application of the color in the center of your lips. Spread the color outwards similar to the way you applied your shadow. Try to choose a color that highlights your shadow or a neutral shade so it does not clash. Next, apply a clear lip gloss over the lipstick using the same technique. The finishing touch is using a brush to apply a blush in the center of your cheeks. Work this color outwards, and remember-less blush is more! These simple DIY prom makeup tips will have you looking like the belle of the ball, and allow you to have elegant prom makeup without spending a fortune.